Survivor: Redemption Island (2011) - 15th place, 4th out. 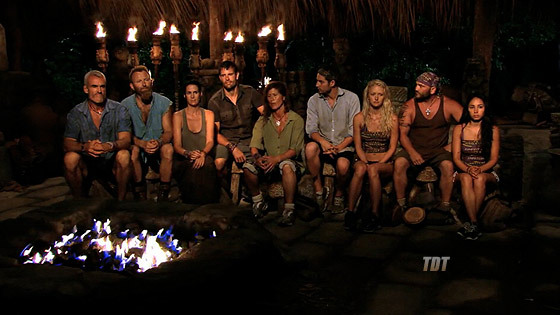 Voted out in Episode 5, "We Hate Our Tribe" (Day 13). Eliminated in a duel (by Matt Elrod) in Episode 6, "Their Red-Headed Stepchild" (Day 14). Longevity totals: In-game - 13 days; Redemption Island - 1 day. Redemption Island Ep.1 RC/IC: "Push It Uphill" - Pushes blocks, works the puzzle, and Zapatera wins! Redemption Island Ep.2 RC/IC: "Smash, Grab, Smash" - Stands by as Ralph smashes tiles, and Zapatera wins again. Redemption Island Ep.3 RC/IC: "Spin Cycle" - On the wheel; after David throws the puzzle, Zapatera "loses." Redemption Island Ep.4 RC/IC: "Toolin' Around" - Sits out as Zapatera wins. Redemption Island Ep.5 RC/IC: "Smoko" - Blindfolded, ordered around by Stephanie; Zapatera loses. Redemption Island Ep. 6 duel: "Grapple & Maze" - Yet another person who loses to Matt (2nd/2). Redemption Island, Ep. 5: Six votes, from Mike, Ralph, Steve, Julie, David, and Sarita (voted out, 6-2). Checking on Russell's infected armpits. Fun! Done. Just gave her Bible to Matt. Gordon Holmes at XfinityTV.com (3/24/11): "Castaway Interview: Krista Klumpp"
Rob Cesternino at RHAP (3/24/11): "Free Bibles for All: Krista Klumpp Talks Survivor"
Daniel Fienberg at HitFix.com (3/26/11): "Krista Klumpp talks Survivor: Redemption Island"
"Personal Claim to Fame: Being elected head cheerleader at Auburn University is my personal claim to fame. I then became a second generation Auburn University head cheerleader. Pet Peeves: When people wear sunglasses inside. Survivor Contestant You Are Most Like: I thought I was most like Natalie White because we had such similar backgrounds, but I expect to play the game with a little more edge. Why you think you will be the sole Survivor: I am a fierce competitor at everything, but I've always had a way of building trust with people. My image will be completely deceiving and my mental game undetectable."